Weeds are among the most stubborn problems you will encounter when maintaining a garden. Although it is true that these species are also plants, the problem is that they eat up the nutrients that are supposed to be provided to your cultivated plants. This is the main reason why most gardeners still look for the best string trimmer. For years, maintenance of gardens has become easier with the help of this tool. The selection of the best weed eater should not be taken lightly. You also have to consider different factors, such as the tool’s impact on nature. To help you with making a decision, read the excerpt below. This tool became one of the most useful string trimmers you could find today due to its unprecedented power in delivering a weed-free lawn. One of its primary features is its PowerDrive Transmission that generates extra motor power to promote the quicker execution of string trimming. Though it is supported by 40-volt MAX lithium battery, it can run for a long time. Furthermore, the BLACK + DECKER LST136W String Trimmer also highlights its PowerCommand dial, which enables you to select between MAX runtime or MAX power. Additionally, this is the best weed trimmer that is perfected with the Automatic Feed Spool (AFS), which keeps the machine line fed whenever necessary without bumping. In case you have to use the tool now and then, charging is a breeze. 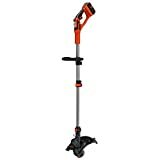 Included in the package of BLACK + DECKER LST136W String Trimmer is a fast charger that builds up the tool power in a couple of hours or even less. In a matter of seconds, it can transform from a trimmer to an edger. The product boasts that it does not require gas or oil to work. There are even no emissions to worry about. This keeps your friendly to the environment even if you carry out the task continually. The convenience of using the weed trimmer is not even an issue, and one proof is that its cutting head can be rotated 180 degrees. Additionally, it has a quick-releasing auxiliary handle. This weed eater is introduced as a lightweight option for gardeners who want to gain more control of their lawn maintenance. Instead of a battery, Husqvarna 128LD String Trimmer is powered by gas. It has a weight of just 11.11 pounds, a power output of one horsepower, and cylinder displacement of 28 cubic centimeters. Among the exceptional attributes of the machine is its Smart Start recoil system. This implies that you will not have the issue starting it, keeping your time consumption reduced. The Husqvarna 128LD String Trimmer is a great option if you want to take care of a weed-filled yard. It is powered by a dual cycle engine, and whenever you bump into an object on the ground, it has a feature that activates the line feed. Configurations of the machine are also manageable with the aid of its convenient trigger controls. If you have to handle a variety of landscapes, it also has attachments that suit almost anything. Although it is supported by gas, it is not heavy compared to its counterparts. You can rely on this string trimmer if your garden is either medium or small in size. However, it does not mean that you can utilize it for large lawns as well. No matter how tall you are, you will not find it working at an odd angle. The company also provides customer support when necessary. Toro did it well when it introduced not just an electric trimmer but an effective edge as well. It is supported by a powerful five-ampere motor that can cut through even the thick stubborn weeds you could find. You could finish your work more easily since it has a 14-inch two-line cutting head that is wider than the standard. Furthermore, in a matter of seconds, you can switch from a trimmer to an edger with its one-step walk behind edging. Reaching farther areas will not be a problem as well since it has an adjustable handle and telescoping shaft. Apart from its quick trimmer to edger feature, you can also rely on its guide wheel. This enables you to move the machine from one point to another without scalping. If you want to return to the trimmer mode, you can only push the button for conversion. The Toro 51480 Electric Trimmer and Edger is designed with a shaft out of aluminum, ensuring it will not rust and stay durable despite the test of time. Trimming can be stressful for the tool, but its shaft will be tough enough to resist problems. 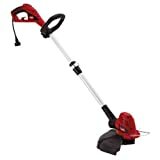 The Toro 51480 Electric Trimmer and Edger, as mentioned earlier, has an adjustable handle for balance and comfort. If you want to obtain a perfect length when cutting, you simply need to pull the trigger of the machine. This weed trimmer is not your typical length cutter. It has two more purposes – mowing and edging. Without the use of any tools, WORX GT2.0 String Trimmer can convert into an in-line edger or mower. Furthermore, it is also designed with a lever that releases quickly for quick adjustments of telescopic height. Paired with the feature is its rotational head that angles up to 90 degrees. Without the bumps, the WORX GT2.0 String Trimmer can work efficiently with the aid of its cutting diameter at 12 inches. This machine is also powered by the battery. Upon purchase, you can get a charger and three-trimmer spools along with it. The weed eater is also cordless, giving you no worries when working at a large lawn. Plus, it is lightweight enough to be brought anywhere. With the features of the machine, you no longer have to worry about protecting your garden and decorations. Furniture, succulents, and flowers will be safeguarded with the aid of a configurable spacer guard of the machine. While trimming, no harm will be done to your cultivated plants since there will be zero accidental cuts even if you work fast. Regardless of your experience, this machine will be very easy to use. It is also supported by wheels, providing ease when transporting the device. Each of the pre-loaded spools in the machine is free provided you have purchased the trimmer. The product also comes with a three-year warranty from the manufacturer. This weed trimmer became one of the best because of its power to eliminate stubborn plants from your garden. Similar to the previous string trimmer, it is also powered by the battery. This gives you no issues with cords or working on a larger property. Even if it loses power, the string trimmer is tested for not losing memory after charging. One of the most compelling features of the GreenWorks 21332 G-MAX String Trimmer is its cutting path measuring 13 inches, giving you easier and quicker execution of weeding. Regardless of dealing with the toughest weeds, you will always end up with great results. The flexible design of the string trimmer is its rotating head that works in three positions. Hard-to-reach areas will still be trimmed when necessary. The versatility of GreenWorks 21332 G-MAX String Trimmer is further proven by its edging wheel. For fast results, it also has an automatic feed head measuring 0.065 inches. User convenience is also not an issue with the string trimmer since it has forearm rest, adjustable handles, and extra grip feature. On a single charge, anticipate using the machine up to half an hour. If you are using a 2AH battery, you only need an hour of charging. Alternatively, utilizing 4AH battery requires a couple of hours powering-up time. It also operates without annoying vibrations and noise, giving you no issues when using it regularly. Each garden has a variety of needs depending on the plants present in it. This is the same case with the caretaker of the lawn. You need to look closely at the tools you will use to get rid of weeds, no matter how tough these can be, more efficiently and smoothly. Before selecting the best brand to trust when it comes to whacking weeds in your garden, you should know more about the product. You cannot only look for the best weed eater and purchase it. For every kind of the equipment, there is a similar purpose and set of perks. To differentiate the different types of best weed wacker, read the information below. 1) Plug-In Weed Eater – This is a kind of weed eater that does not utilize oil or gas. From the name itself, you need to plug it in for electric supply. Compared to its counterparts powered by oil, it is less potent. Nonetheless, you will find it useful if you will take care of small-sized lawns. There are also disadvantages by selecting this type of weed eaters, such as limited motion and maneuverability. If you are looking for a lighter machine, a plug-in weed eater is a great option. Noise will never be an issue as well even if you use it consistently. Others even added that it is easy to start. At present, there are also electric weed eaters that are already rechargeable. 2) Gas-Powered Weed Eater – You will find this most useful if you are going to eradicate towering weeds or grass. It is naturally heavier than the first type of the machine. It may be disadvantageous in a sense that it generates emissions from its exhaust system. One of the notable features of this weed eater is its translucent tank that makes the fuel level visible. Since gas-powered weed eater does not have a cord, you could use it to eliminate strings even in hard-to-reach areas. 3) Battery-Powered Weed Eater – This weed eater is convenient to use since it does not only operate quietly but lightweight as well. With these advantages, battery-powered weed eater is considered highly portable. Even if there is a recent power outage at your place, you do not have to worry about sustaining a weed-free lawn. However, always be prepared with handy batteries when replacement is necessary. 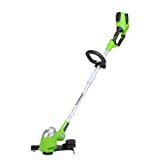 If you are about to purchase the best lawn trimmer, there are careful considerations you have to make. Besides selecting a type of the machine, you also have to take regard of the features to look for. In such cases, you will be able to prevent buying a tool that is not on par with the industry standards. Remember, not all purchasable materials on the market can be the best grass trimmer. You will determine this yourself. To help you with the evaluation, here are top factors you have to concentrate on. 1) Handle – The telescoping handle matters a lot when it comes to the selection of the machine. This is where you have to try holding the tool itself and find out if there is a bit of challenge utilizing it. Check if it will not make you stoop over or hold the device at an awkward angle. You will determine if a machine is comfortable enough yourself. Furthermore, under this attribute, you will choose whether you need curved or straight handles. 2) Weight – Most gardeners look for lightweight weed trimmer. Apparently, by doing so, you will be able to prevent premature breakage and enforce more control. A good option is a tool that weighs within a range of three to 4.5 kilograms (kg). 3) Gap – There are weed eaters around that allow tall plants to surround the machine’s cutting head. This could either stall or slow down the equipment. Tip: Apart from selecting a weed eater that has a small gap, you can consider purchasing one that comes with a protective sleeve between the trimmer shaft and cutting component. 4) Power – You should verify the strength of the weed eater. In the case it is supported by the battery, you have to check how long it lasts before replacement of power source. It is best to find a tool with more power, so the execution of weed elimination is quicker and much more convenient. Once you have answered the question “What is the best weed eater?”, you have to start learning how the machine is used properly. There are recommendations from the tool manufacturers and experienced gardeners. Remember, with the improper utilization of the device, you may have issues with controlling it and protecting it from easy breakage. To provide you a few of the tool’s use and safety tips, here are the following. 1) Always Wear Safety Gear – It may be a simpler job compared to other gardening activities, but it still requires care. As much as possible, you wear protective gear for the eyes, hands, and arms. While you are cutting the weeds, you may likely encounter debris and dirt. If you also consider using an ear protection, you can even reduce the sound of the machine. 2) Check the Ground before Cutting – Before you begin using the weed trimmer, ensure that no pebbles, metal, or glass can get caught by the machine. If there are other people around, you should kindly ask them to distance themselves not until you are finished with the job. If your car is nearby, park it at a farther place for pebbles from the machine can damage glass and paintwork of your vehicle. 3) Do Not Settle With the Standard – It is a common practice for gardeners to use their weed trimmers by positioning it above the weeds and cutting these in length. Surprisingly, this is not the ideal technique. This could even result in poor scaling of the lawn. 4) Taper Fences, Walls, and Curbs – This is one of the most efficient strategies, which involves holding the machine for the string to hit the grass while following a slope angle. From there on, you will see that the tool will cut a big portion of the lawn. Out of all the products listed above, it is apparent BLACK + DECKER LST136W String Trimmer is the winner of the roundup. When it comes to convenience, you will never encounter issues. It is powered by battery and converts to an edger in seconds. Even if you check out feedbacks from its existing users, there is no denying that it wins when it comes to ease of use. This is also the most reliable option if you want to reduce time wastage, carbon footprint, and bumps. Otherwise, you can try out other weed eaters depending on your preferences. Only do not forget to consider the factors in choosing one as mentioned above.